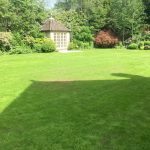 Having been called in after a major new house build was completed the plan was to use the existing soil to create a new lawn. Over the winter the soil settled and wasn’t deemed good enough for a quality lawn. The owners then decided they would like a wildlife pond, so when spring had set in and the ground dried a little we set about constructing the pond. It needed to be level within a few millimetre level and we decided to include a drain off pipe for winter along a water feed to keep it topped up in the summer. Shelves were created for planting and the whole base lined with sand. Both a fabric underlay and bitumen liner were used and it was graded into the soil. Over 200 tons of soil were brought in and levelled using a three and five tonne digger along with a five tonne dumper. The whole area had a hand finish and seeded with a bespoke blend to suit the condition. A control release fertiliser was applied to the area was then rolled to bed the seed and in and nature took its course. Once the seed had germinated and the grass was at the two leaf stage we could then tackle the weeds with a gentle weed killer. Regular mowing and return visits to over seed would be needed and soon beautiful lawn would appear. We will return regularly to fertilise weed kill, monitor and undertake any mechanical treatments such as scarification/over seeding and aeration needed to keep the lawn in good health.